In the short time that we've been blogging we've amassed an amazing fan base, and we couldn't be more humbled or grateful for all of your sweet comments and encouragement! Your readership and support is what makes this all possible, so now we're turning to you guys to ask for your help in voting for our blog. We can't do it without you! For all of our fellow US bloggers, you should definitely enter your blog in the R29 contest if you haven't already, and let us know so we can vote for you! And for those blogging internationally, sadly the contest isn't open to you, but we can still use all your help in getting us to #1. It's super easy. That's it! Easy breezy and a thousand thanks! I'm in love with your blog and the name is so DARLING! Thanks for your sweet comment on my blog!!! I like yours too! The blazer and the pants combo is hot! Thank You, for the lovely comment on my blog. I really appreciate it. Thanks, for following. You have an amazing blog! Good luck love! Great pics - luv the clutch!!! Hey Marcystop bloggers, you have such a stylish and gorgeous blog! Came across your blog via R29 contest and loving the outfits, the stories and friendliness here! 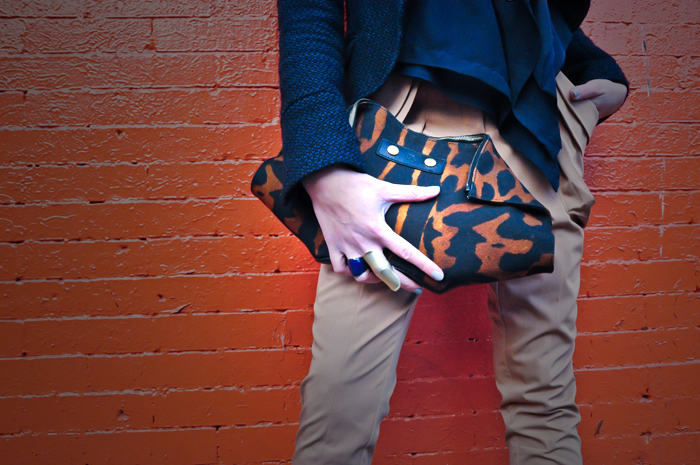 The pants and clutch in this post are uberchic! BTW, I just voted for you (your 125 vote, yay!! )Good luck! gorgeous! i'm loving your clutch!!! p.s thanks for the lovely comment hun! and thank you so much for followin! I'm your newest follower AND voted for you on R19! Love this blue and brown combo! U look so chic! The purse is really nice!! Love it! Thanks for your comment. Lovely outfit and I totally adore your clutch! beautiful jacket and love the fit of your pants. congrats on the success of your blog! love the silhouette this creates! I voted for ya! Your picture is stunning and I love the layers that are going on in this outfit!! Good luck! That clutch is amazing!! Loving all your outfits on your blog. i love your outfit! especially that clutch!